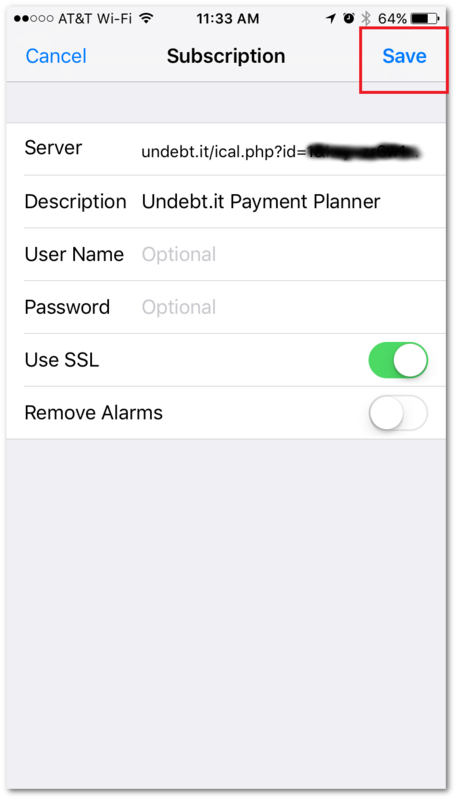 Undebt.it+ has a cool new feature for you to play with: Google Calendar and Apple iCloud integration. 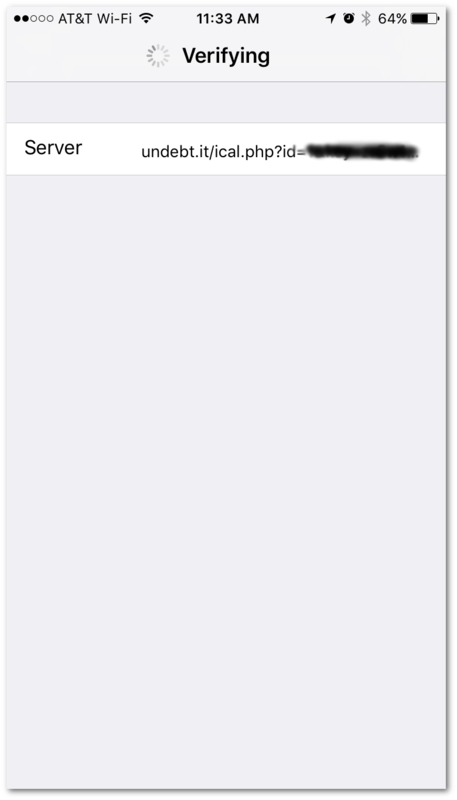 This feature will also work with other calendar apps that let you subscribe to ICS or ical format calendar files by URL. You’ll be able to quickly see your entire payment schedule on your mobile device, tablet, or other internet connected calendar. If you use the Bill Management feature, you’ll see your current and projected bills in there too. 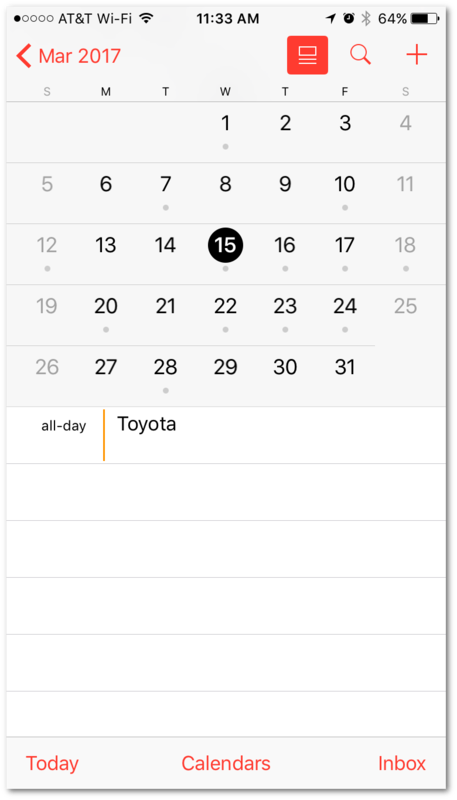 The calendar integration feature is one-way (Undebt.it > your calendar); meaning that Undebt.it pushes the information into the calendar. 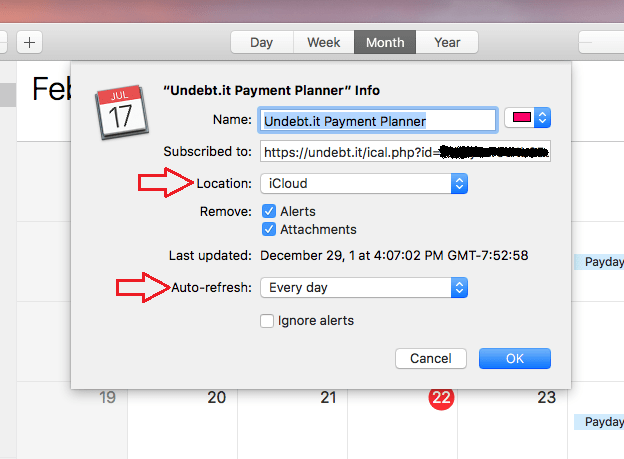 If you change or delete a calendar payment, it will not update your Undebt.it information. 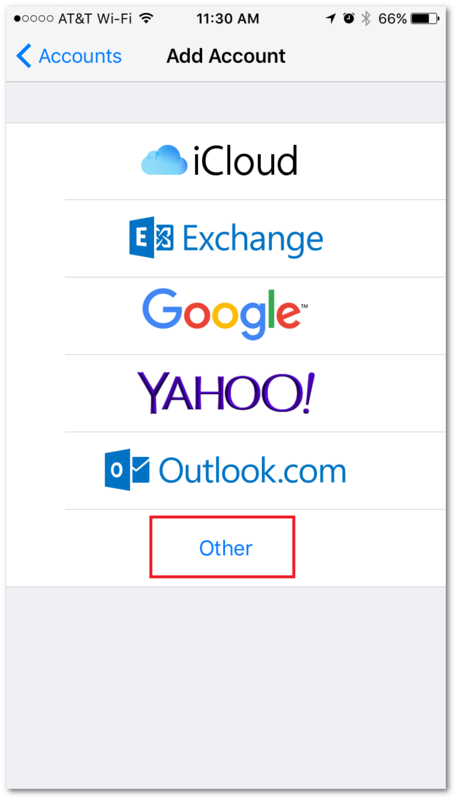 This is the URL that you’ll use to setup the link to your calendar application in the steps below. 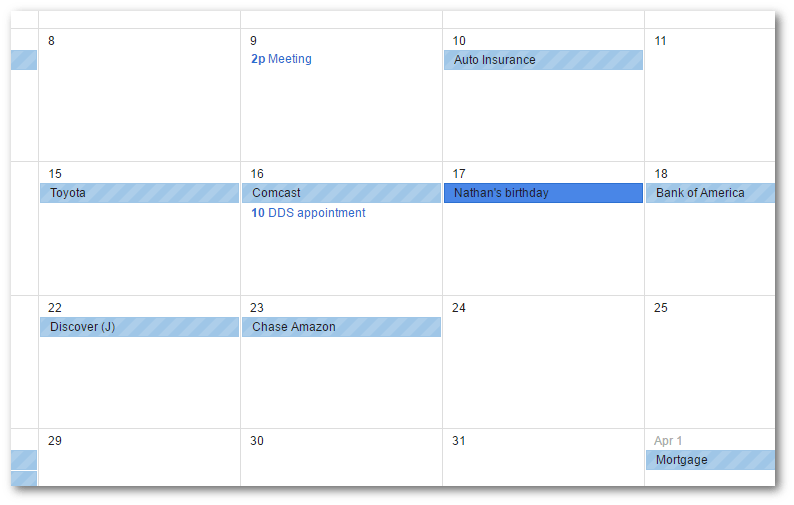 You can use the link to setup as many calendars as you like (for example, you can use Google Calendar on your desktop PC and also have your iPhone setup with iCalendar). Be sure to keep this link private. 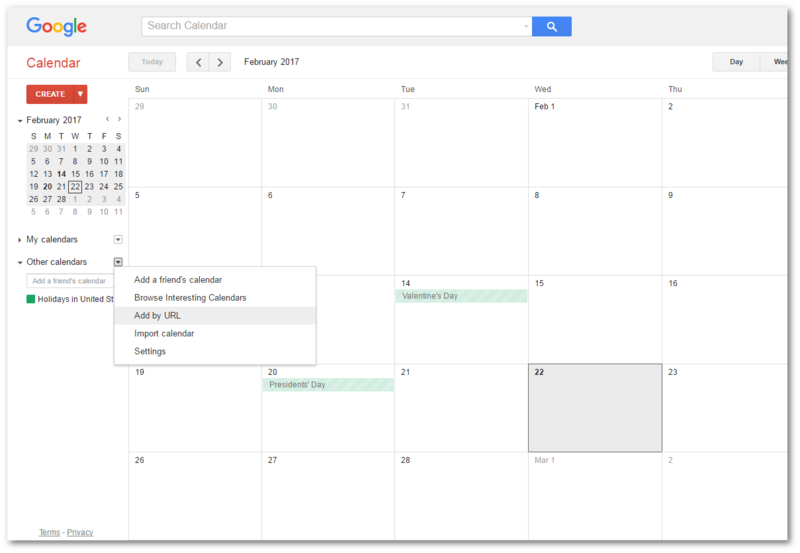 Log into your Google Calendar account and go down to the Other Calendars section. Click on the down arrow and select “Add by URL“. Enter your calendar link in the box. You do not need to check the “make public” box. Lastly, click the “Add Calendar” button. 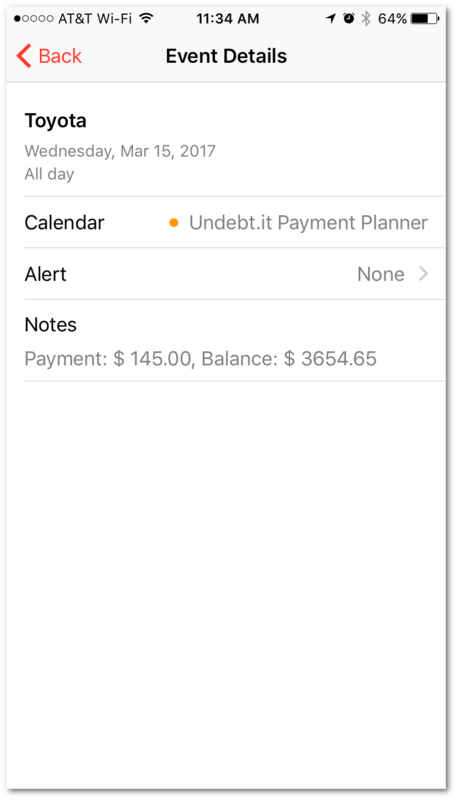 After the calendar loads, you’ll see all of your planned debt & bill payments in your calendar mixed in with your other appointments and dates. You can also change the color of your Undebt.it calendar if you like. Click on the account in the calendar, then click on the “More Details” button to see the planned payment information. Also shown is the minimum payment amount and account balance. Note: Google updates linked calendars roughly once a day and there is currently no way that I know of to force an update. 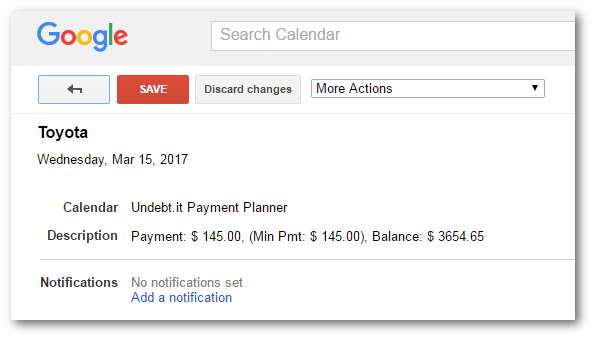 If you make a change or a payment on the Undebt.it website, it may take up to a day for your Google Calendar to update. 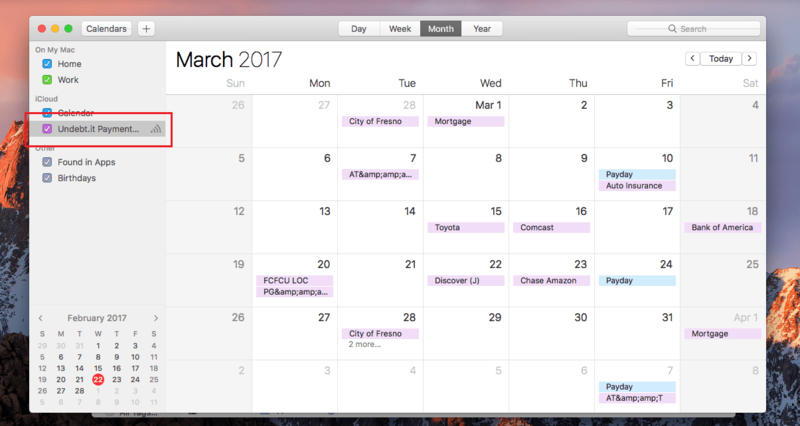 Using the Calendar app on a Mac, you can setup a subscribed calendar that will update all of your iOS devices on your iCloud account. First open Calendar and go to File > New Calendar Subscription. 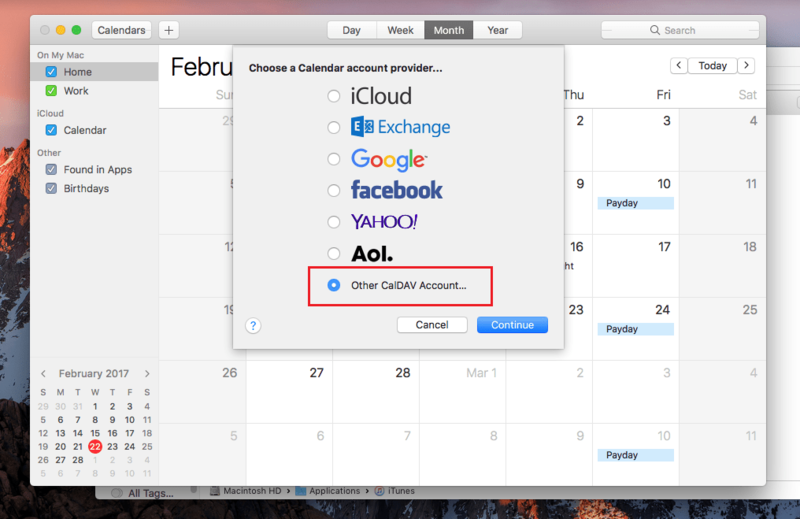 Choose the Other CalDAV Account option and press Continue. Next, enter the link address to your Undebt.it calendar; copy and paste if possible. 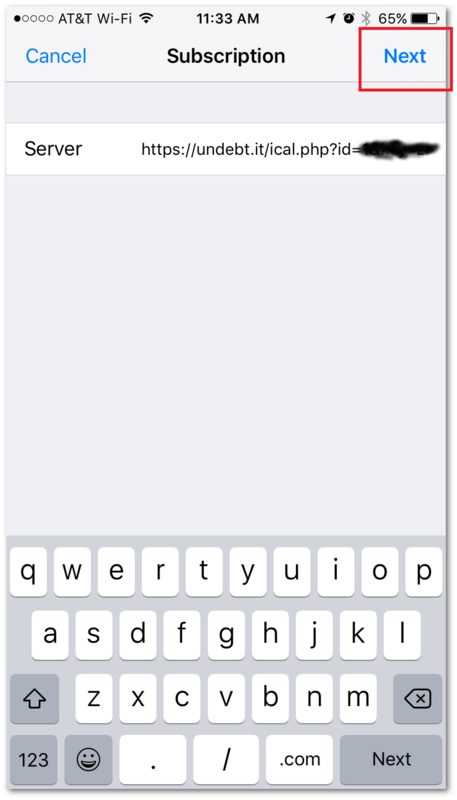 After entering the address, you’ll see the screen below. The Location options refers to where the subscription is stored. 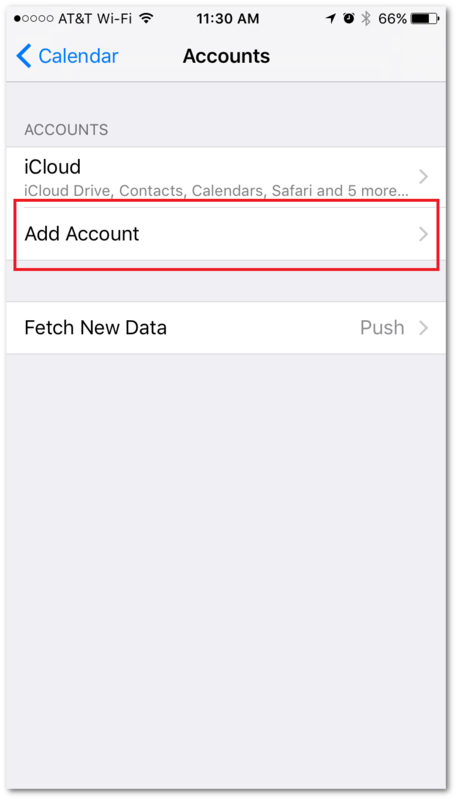 Select iCloud if you to use the calendar on all of your iCloud connected devices. 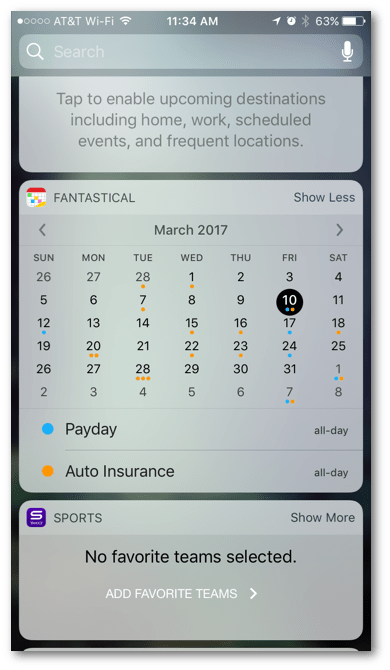 The Auto-refresh controls when the calendar is updated. Selecting Every Day is a good option. Please don’t select Every Hour; it would cause a lot of traffic and potentially slow down the site. 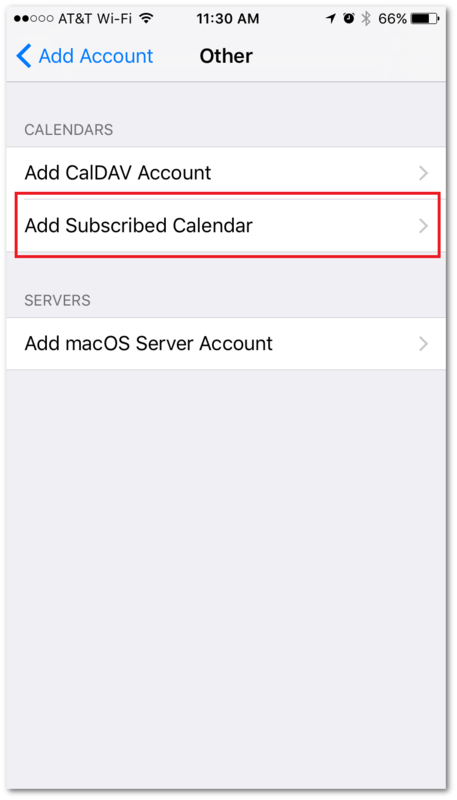 Here is some more info about subscribed calendars from Apple. You can change the name of the calendar here if you like. You can also use Outlook to view your scheduled payments. Depending on your version of Outlook, the steps may be slightly different but the concept is the same. First, go to File > Info and choose Accounts Settings. Click on the Internet Calendars tab then click on the New button. 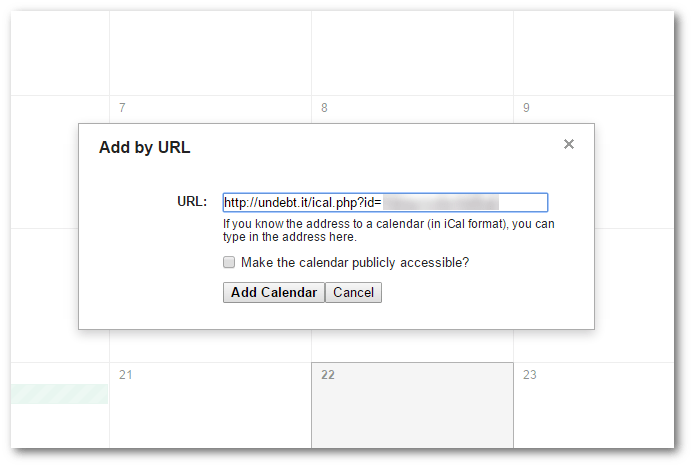 Paste in the URL to your Undebt.it calendar and click the Add button. 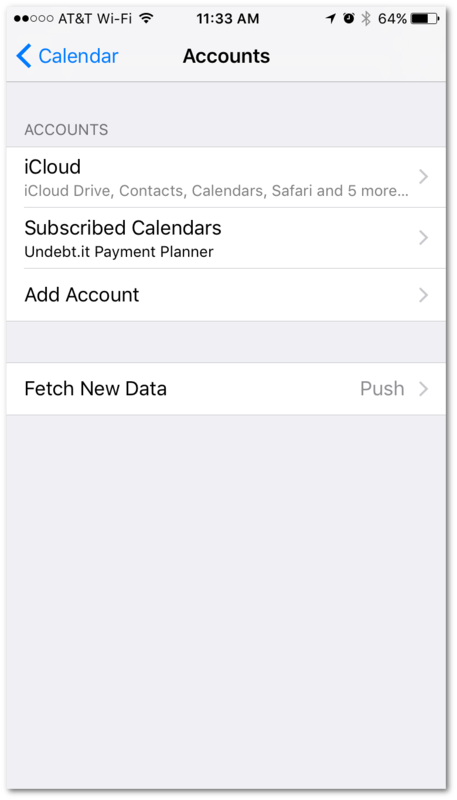 The Subscription Options window lets you change the calendar name. Check the Update Limit box and then click Ok. Once the calendar is added, click on the Send/Receive button to load the info.